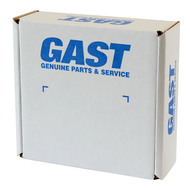 Gast AJ126F 10 micron intake filter used on R6, R6P, R6PS, R6PP, and R9 series regenerative blowers. Includes filter housing as well as filter element. 2" NPT ports.